I’m about to take you on a food extravaganza. Actually, a meat lover’s dream, to be exact. This isn’t just any food journey, but its exploration of meat in all of it’s forms, in a restaurant created by a master celebrity chef who has helped to transform the culinary world. My husband and I decided to take an extended weekend trip to Las Vegas. We had enough airline miles to get ourselves a free roundtrip ticket from Los Angeles to Las Vegas, and we had an offer for two free nights hotel stay at Encore Hotel & Resort, so how could we resist? It was essentially a free vacation to Las Vegas. 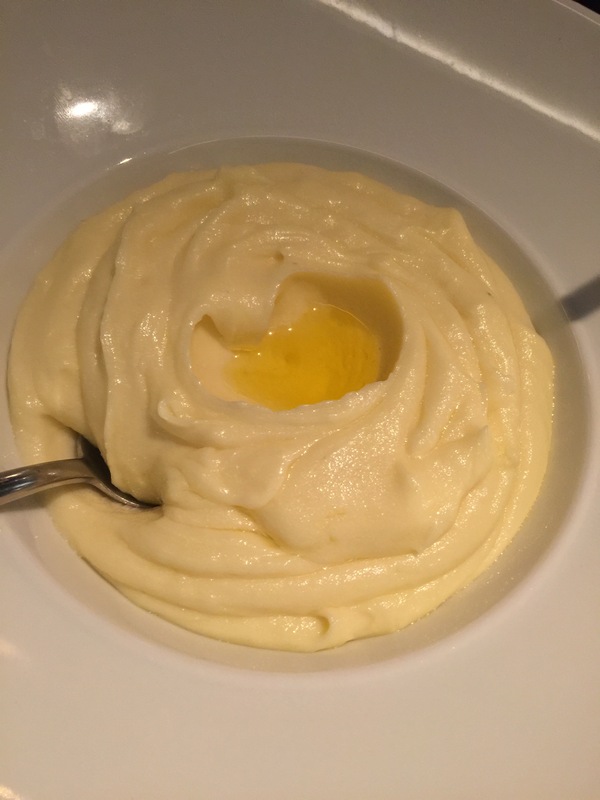 As such, my husband thought it would be fun to try out a new restaurant by a chef who has a restaurant here in Beverly Hills that we’ve been to and fell in love with. 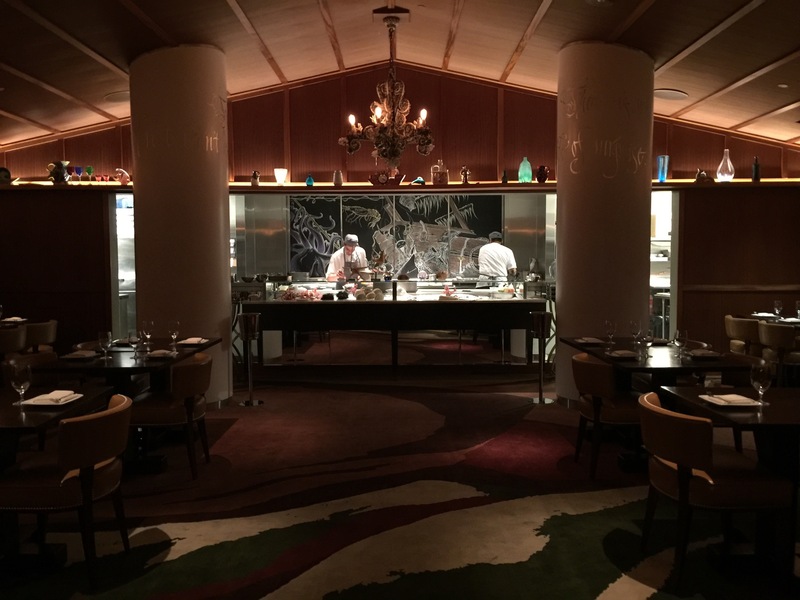 Last year, I wrote a couple of blog posts about my experience at a restaurant at the SLS Hotel in Beverly Hills and their famous restaurant, The Bazaar by Jose Andres. At the time when my husband selected this restaurant for us to dine at, I had lightly complained because I wasn’t too sure how much I would like it, but he told me to trust him, so I had no choice but to do so. One dinner at The Bazaar and my whole opinion about the restaurant, the food, the service and the experience was completely transformed. 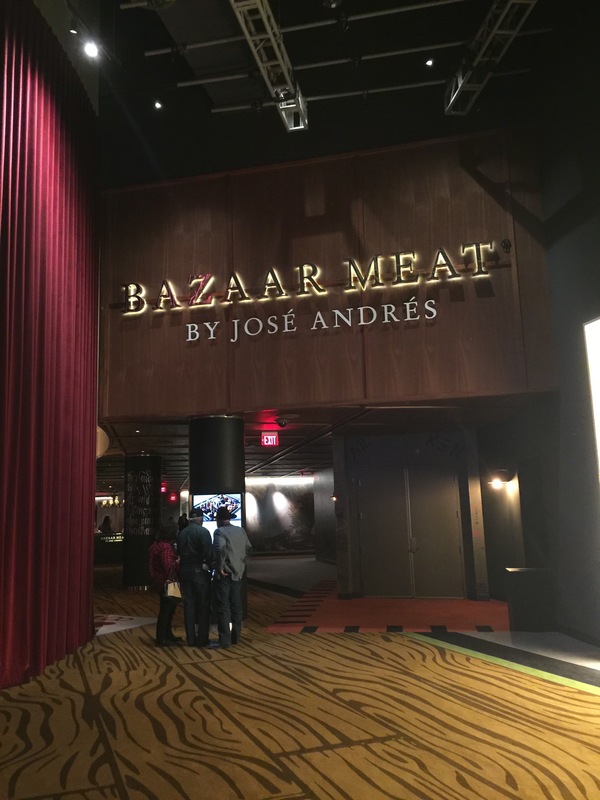 So, when my husband told me that there was a SLS Hotel that had recently opened up in Las Vegas and it featured a restaurant called Bazaar Meat by Jose Andres, how could I say no? Same chef-owner, same unique and modern concept, but this time solely focused on my favorite food group, meat! This dark wood, semi-hunting lodge inspired interior decor sets the tone for the meat extravaganza that we were about to feast upon. 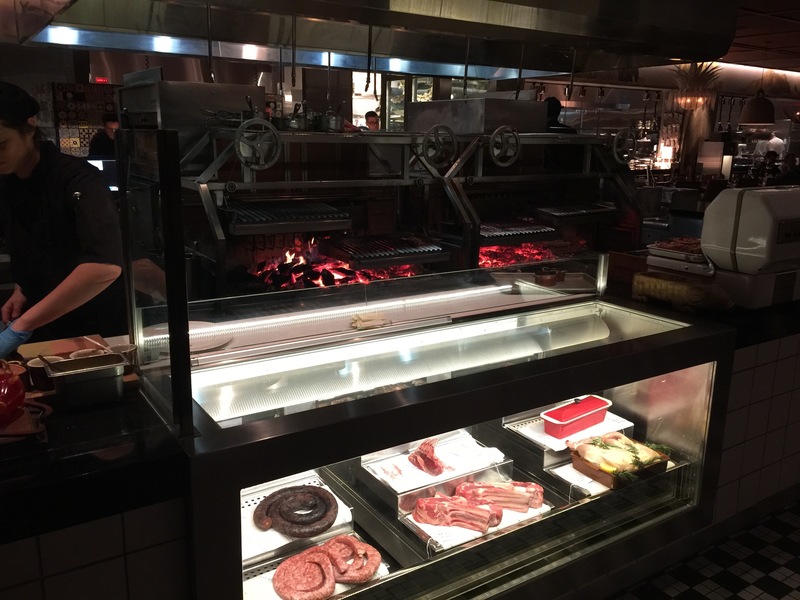 When you step into the restaurant, the first thing you see is a large, open wood-burning grill. The aroma of smoked and grilled meat hits your nose and you can’t help be salivate at all of the yummy deliciousness you’re about to experience. 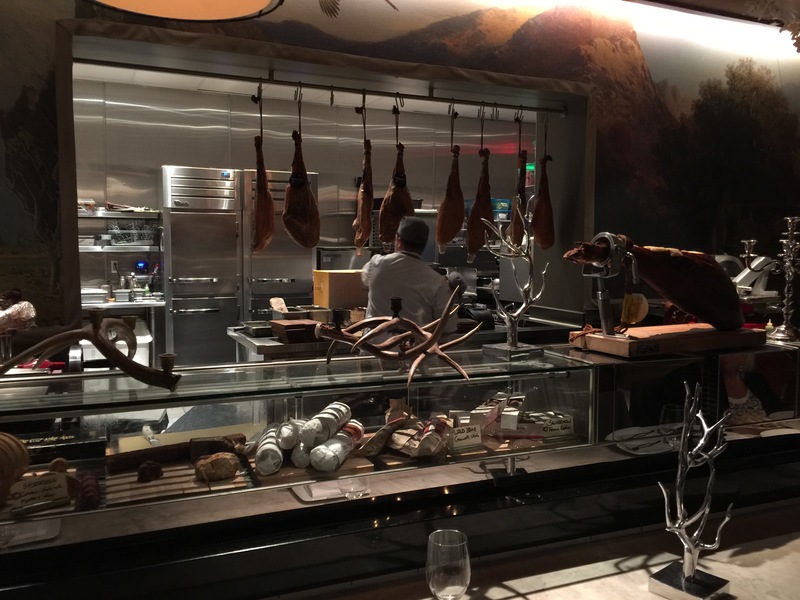 Off to the side, there’s a glass display case that features cuts of cured and dry-aged meats that are just waiting to be ordered, prepared, and served at the table. One of the items that the restaurant is known for is their whole suckling pig, and sure enough, hanging in this display case (not pictured here) was a whole suckling pig. If meat is not your thing, this restaurant isn’t for you. But, if you like meat in any way, shape or form, Bazaar Meat has everything you could have ever asked for. 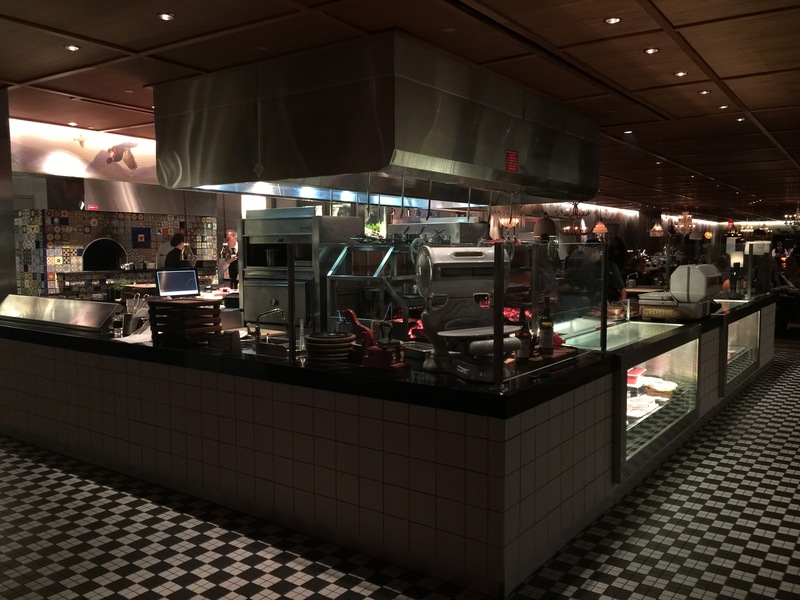 As you walk further into the restaurant, there are other open kitchen stations, some with bar seating so you can watch the chefs prepare plates right in front of your eyes. These stations contain cured meats that are sliced for small bites, or you can see whole dry-cured ham legs hanging in the background. 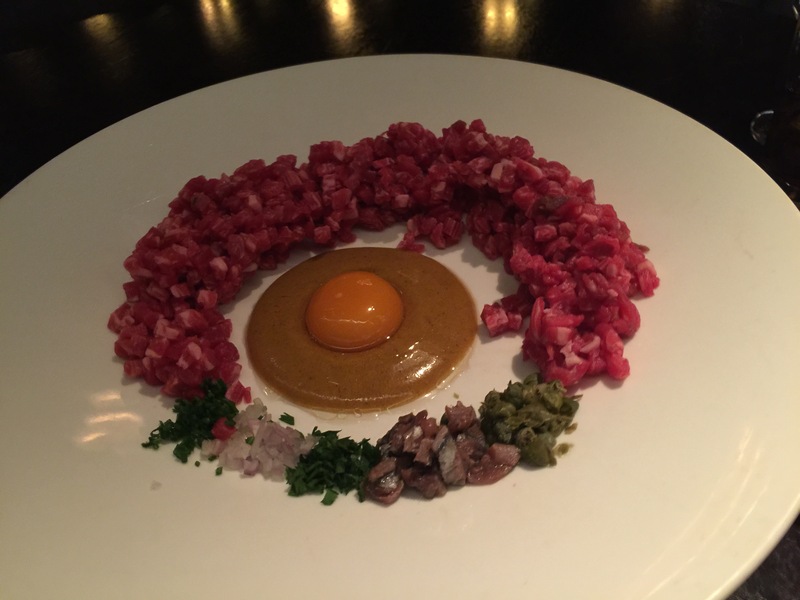 Raw meat options, such as tartare is also prepared from this station. And finally, in the back of the restaurant, there’s a small open fresh seafood kitchen. While this is a meat restaurant, there are some amazing seafood options available as well. Seafood includes a raw bar which serves live scallops, sea urchin, and king crab legs to name a few items. There’s also an oyster bar with freshly shucked oysters. And there’s also several different types of caviar being served up as well. Before we can get to dinner though, my husband wanted to order a drink. After looking through the drink menu, he decided on a drink called Landing Gear. 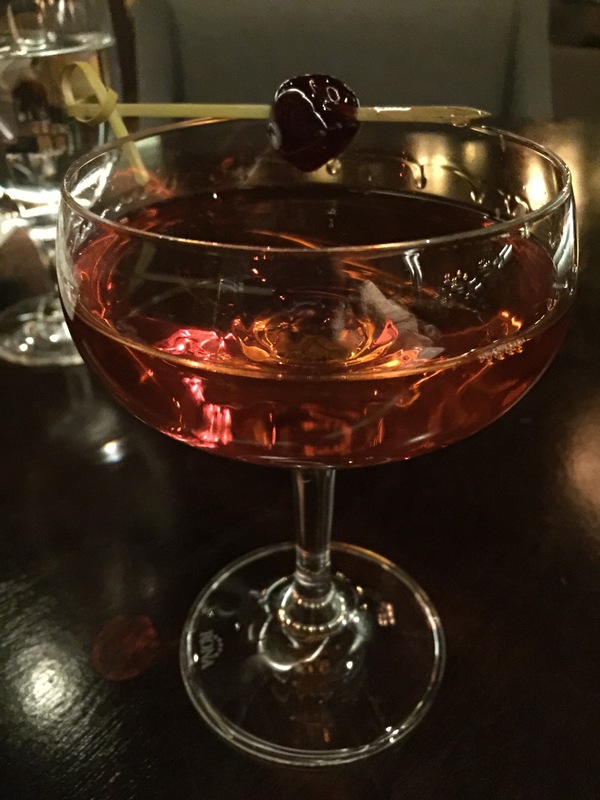 Made with Buffalo Trace bourbon, Aperol, Benedictine, and allspice dram, my husband thought that the drink was really sweet. The drink was much sweeter than he thought it would be, sort of a sugary sweet, which is surprising since much of the alcohol in the drink is more herbal in nature than sugary in nature. Allspice dram is an allspice flavored liqueur from Jamaica, Aperol is an herbal and orange aperitif which contains bitters, which makes my husband happy, and Benedictine which is also an herbal liqueur, so my husband was picturing more of an herbal-flavored drink. That’s not to say he didn’t like the Landing Gear though. He thought it was smooth and easy to drink, especially since it was sweeter than anticipated. Also, the Buffalo Trace whiskey was terrific and my husband really liked the whiskey. Later on in our meal, after my husband finished the Landing Gear he decided he’d like another drink. He had seen that many of the tables around us had ordered a drink that was apparently a specialty of the restaurant, and though a little gimmicky and probably not normally to my husband’s liking, he decided to have fun with it and ask the waiter to bring him the same drink that the other tables had ordered, the Magic Mojito. Essentially, the mojito comes in a martini glass with cotton candy floating atop the mojito. 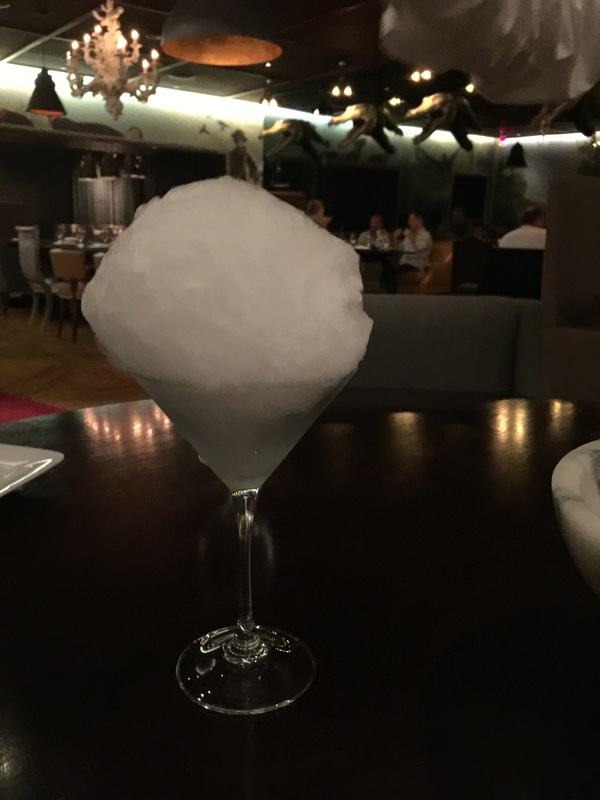 Then at the table, more of the mojito is poured over the cotton candy causing the cotton candy to dissolve completely releasing the sugar into the drink. And there you have your magic mojito, it transforms right in front of your very eyes. It was really fun and cool to watch them pour the mojito over the cotton candy. It’s easy to see why everyone wants to order one, just for the fun factor of it. 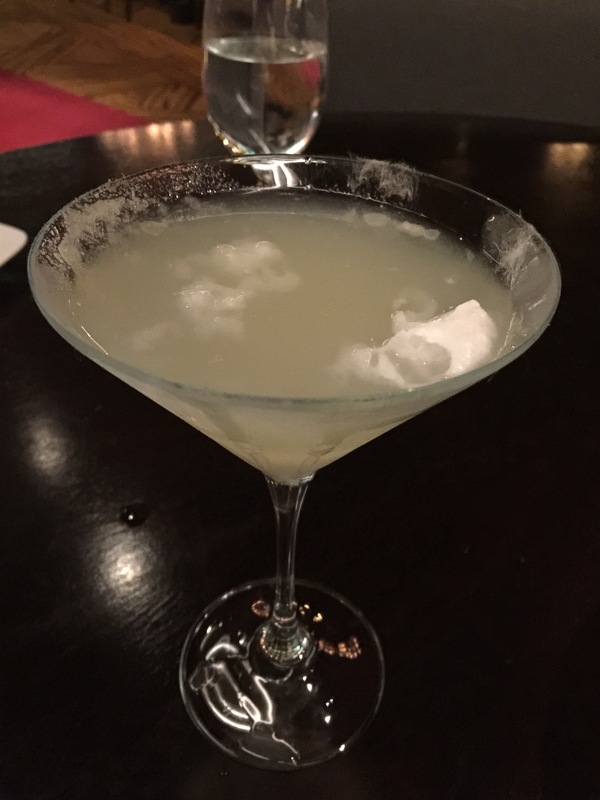 My husband thought that the drink itself was actually quite tasty and minty, which he enjoyed. Time for the food. We figured that we were here to have a good time and to eat. So that’s what we were going to do. We’d order a little bit of a lot of items so that we could try a bunch of things. The first thing we ordered was the little starter sandwiches. 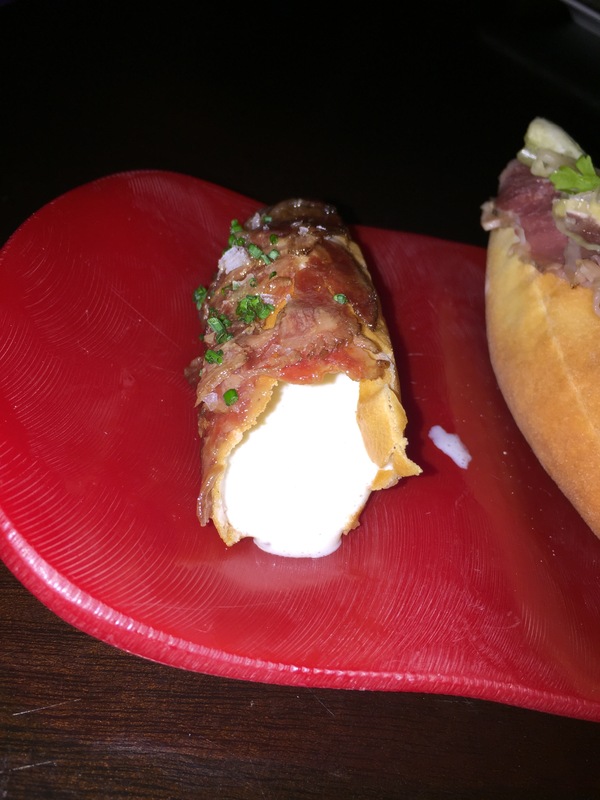 We ordered one Philly cheesesteak just like they serve at The Bazaar in Beverly Hills, and one reuben made with corned beef, sauerkraut, thousand island, Swiss espuma and air bread. I took the Philly cheesesteak since I loved it so much at The Bazaar. That air bread is just so amazing, it’s like nothing you’ve ever experienced before. And that cheese, liquid cheese oozing out of the air bread once you take a bite of the sandwich is just phenomenal. And of course the kobe beef used, so flavorful and tender and just perfect. My husband who had the reuben thought it was equally as fantastic. He knew the air bread would be good, but he was surprised that he liked this sandwich as much as he did. He definitely said that you have to be a fan of thousand island though to really enjoy this sandwich, but the combination of the Swiss cheese and the corned beef and the sauerkraut with the thousand island sauce was just perfect, rich, sweet, and delicious. My husband still talks about how good his reuben was. Our next dish was Jose’s Asian tacos. Made with jamon iberico de bellota, toasted nori and flying fish roe, this was definitely a unique and flavorful dish. 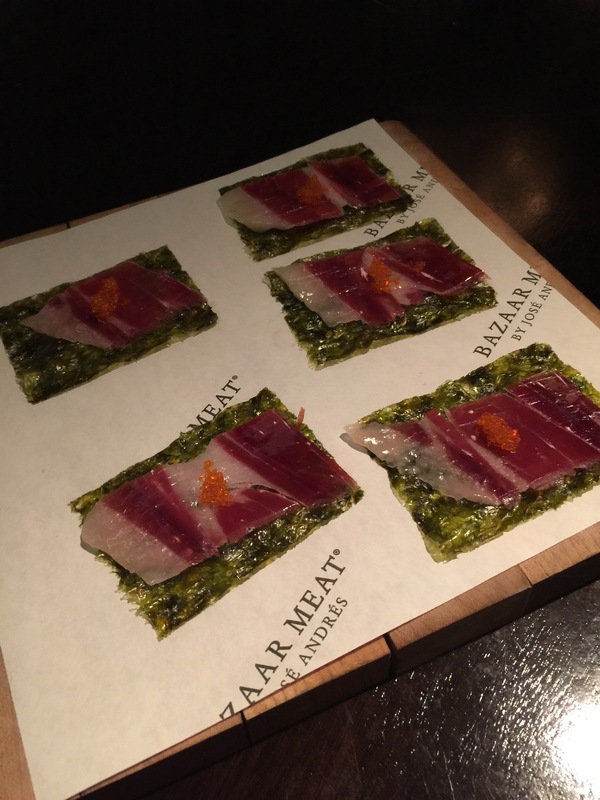 Essentially, a small square of toasted nori (seaweed) is the “taco shell” upon which sits a square of jamon iberico de bellota with a little dab of flying fish roe to round it all together. The flavor you get is amazing. It’s a little salty, though if you think about it, every element to this dish is salty, so while it’s salty, it’s kind of surprising that the dish doesn’t taste saltier. 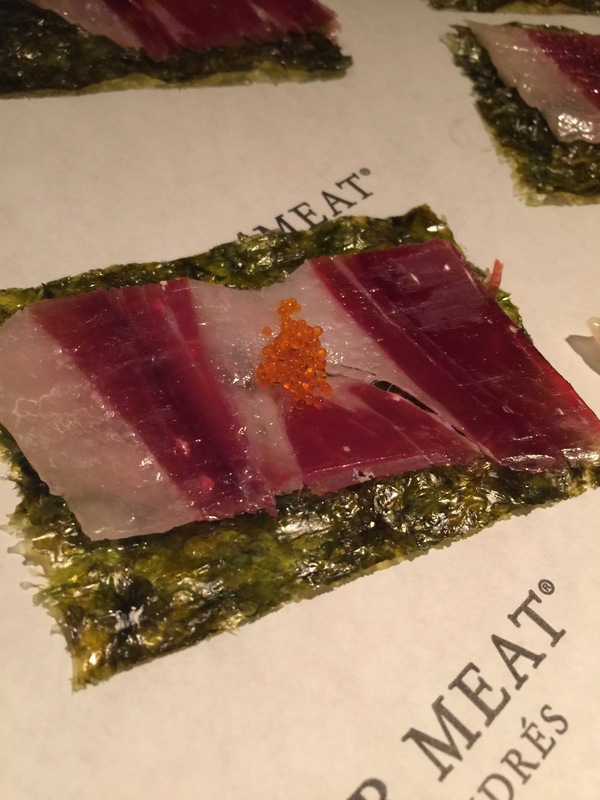 It’s something about the combination of these three items together that combine so so harmoniously, the Asian flavors of the seaweed, the Spanish cured ham, and then the fish roe. Asian tacos definitely fit the name because the overall flavor profile really is Asian-inspired due to the nori. The crunch from the nori also gives the dish texture and crunch to contrast with the jamon which just melts in your mouth. I couldn’t resist ordering the next dish, which again was just a small finger foods sandwich. The sloppy joe just sounded fun and whimsical and a reminder of childhood. Made with beef bolognese, fried straw potatoes and a steamed bun, 2 sloppy joe’s came in one order, perfect for my husband and I to split. While this may have been the simplest dish we ordered for dinner, its one of those dishes that really stands out in my mind. A childhood classic is absolutely elevated to another level. The steamed bun was fantastic and tender, the beef bolognese was packed full of flavor that filled every bite, and those potato straws added crunch and texture to compliment the tender bread. It was fun, whimsical, but best of all, it was absolutely delicious. I had debated whether or not I wanted to order this dish, and now I’m so glad that we did because I would have hated to have missed out on all this sloppy joe goodness. Now we come to the more substantial dishes of the evening. First off, I diced to get the classic tartare. According to the menu the tartare first appeared in Escoffer’s culinary guide in 1921, as a variant of “Beefsteak a’ l’Americaine” named for the tartar sauce with which it was served. 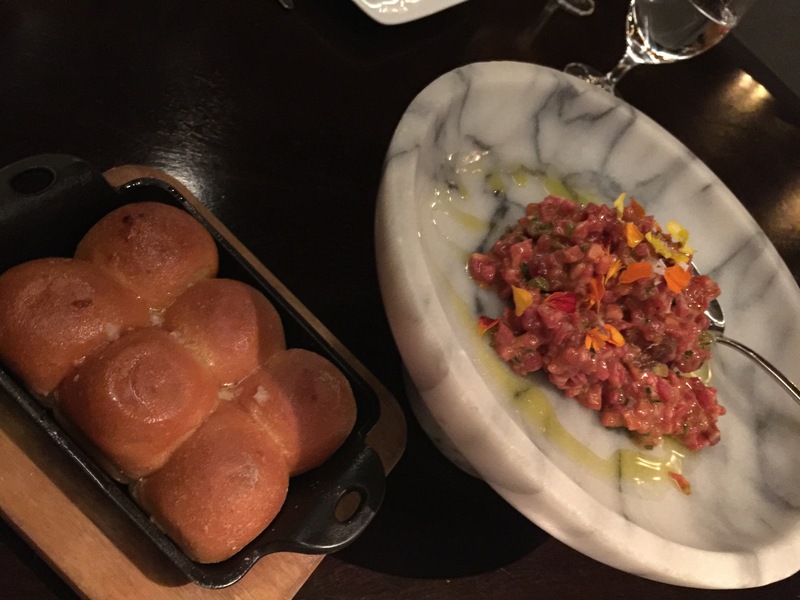 The Classic tartare is made with hand-cut beef sirloin, savora mustard, egg yolk, HP sauce, anchovy and served with Parker House rolls. The bonus to this dish is that it is actually made tableside for you once ordered. The ingredients for the tartare are presented to you and explained before the server mixes all the ingredients together and adds in some spices. When the tartare is complete, it is scooped into beautiful marble dish and finished with a drizzle of sherry and sprinkled with some edible flowers. Served with Parker House rolls in a cast iron pan, the idea is to make a beef tartare mini sandwich. The tableside presentation is really interesting and fun, and different. You get the experience of watching your dish come together. The flavor of the tartare is incredible. Without knowing that it is raw meat, if you just tasted it, you’d never guess that this was raw beef. Every bite is packed with flavor from the combination of the vinegar to the egg yolk to the HP sauce to the anchovies and the mustard, you can taste all of the elements and ingredients. 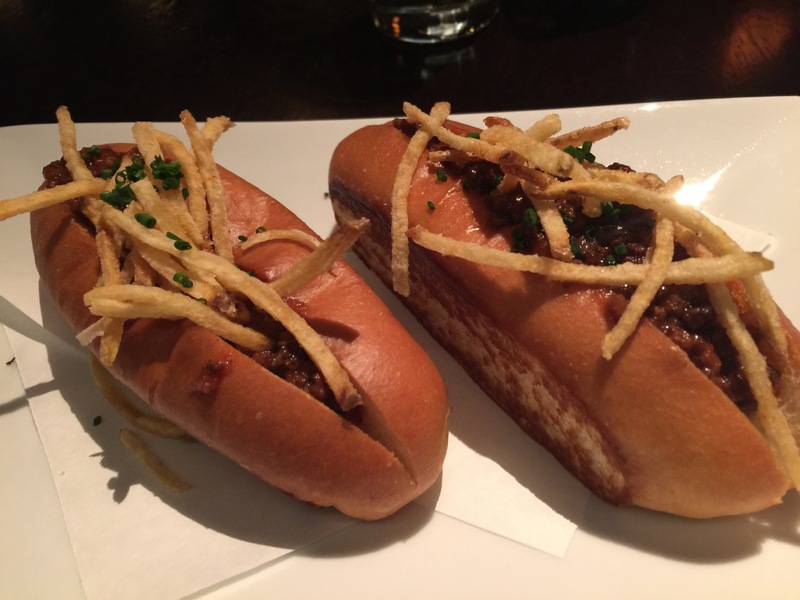 The flavors are strong and rich and the beef is so tender it melts in your mouth. The Parker House rolls are fantastic and buttery and a crispy on the outside and hot and airy on the inside. 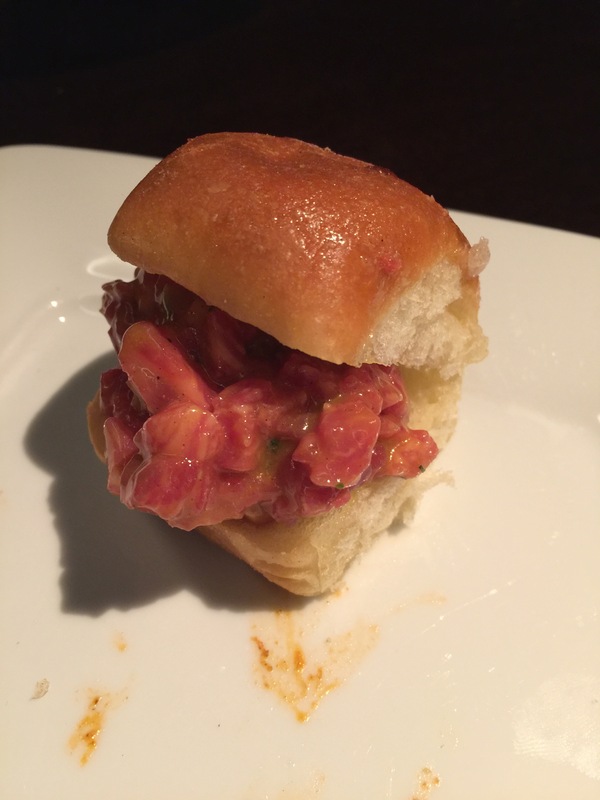 The little sliders you make with the rolls and the tartare are such a wonderful concept, and the flavor is so spot on, this dish is hard to beat. 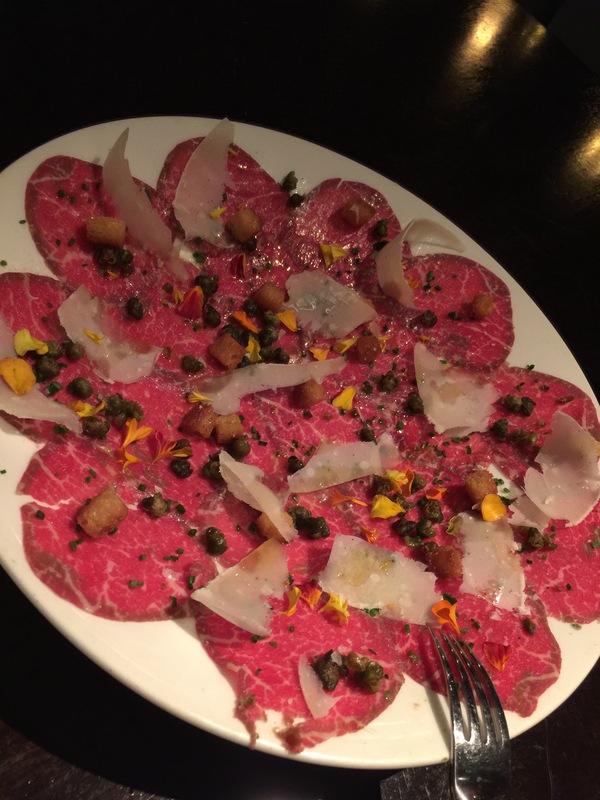 As I’ve said, I’m a meat lover and I fluctuated between ordering the tartare ordering the carpaccio. I’m definitely a fan of both, so my husband told me that we should live a little and just order both. So, I decided on the Vittore 1950 carpaccio. The menu states that carpaccios were first popularized at Harry’s Bar in Venice around 1950 and named after Venetian artist Vittore Carpaccio due to the red and white hues common in his paintings. 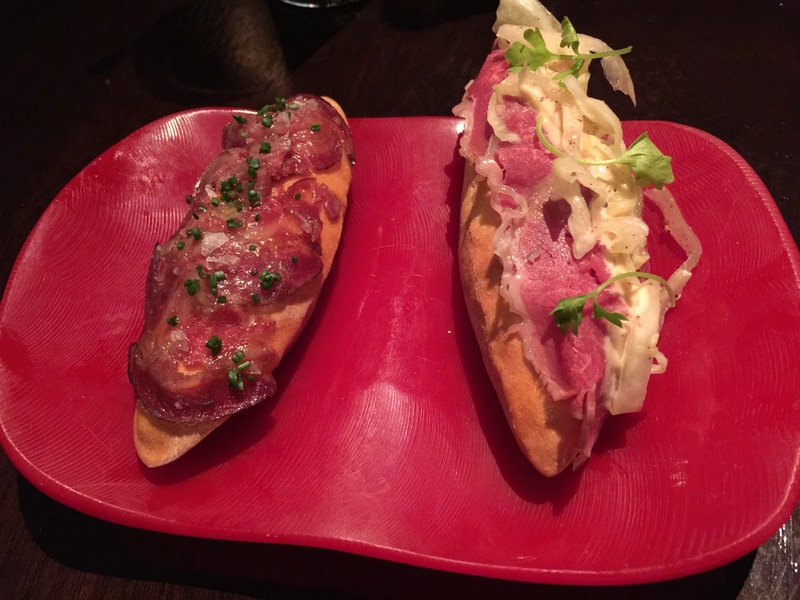 The Vittore 1950 is made with tenderloin of beef, black pepper, Parmesan cheese, capers, croutons and Sherry dressing. I thought that the carpaccio was delicious. The meat was incredible tender and melt-in-your-mouth. The crunchy bits of croutons that were sprinkled over the carpaccio added an incredible amount of crunch to the dish. The bread wasn’t dense like you would think croutons would be, but more like crunchy air bread that they use in other dishes, where it was almost like biting into something that was so light it was almost as if nothing was there. The salty capers and the tang of the Sherry dressing really completed the flavors of the carpaccio. How they ever slice the tenderloin so thin always blows my mind, it’s so paper-thin that it’s hard to peel off the plate. My husband, who will eat carpaccio, but it would never be his thing to order, even thought this Vittore 1950 carpaccio was mighty tasty. The next dish is one that my husband and I debated on when we were ordering our food. My husband saw it on the menu and immediately wanted to order it. I was less sure about ordering it, and when I finally relented, my husband wanted to double the size of what I thought we should order. This was a meat dish sold by the ounce, and while I thought we could order 2 ounces, my husband wanted to order 4 ounces. 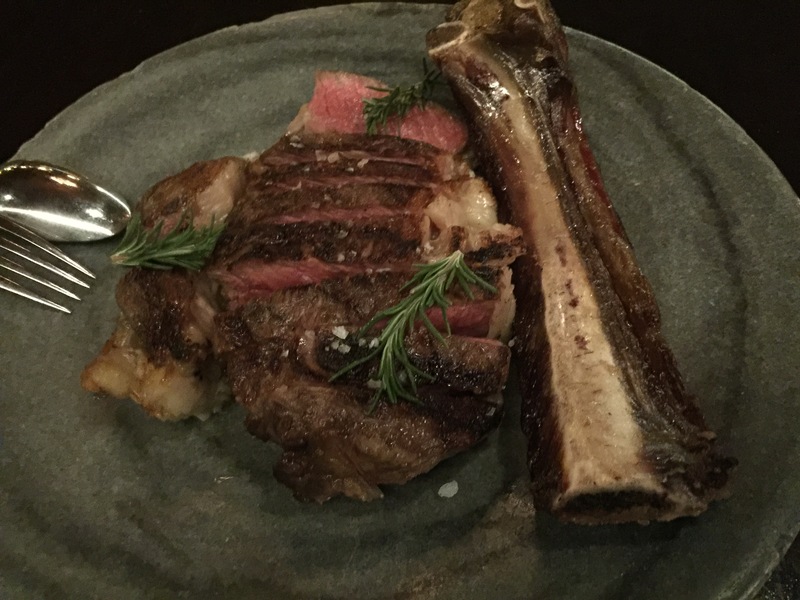 What we ordered was A5 Kobe Eye of the Rib beef from Hyogo Prefecture in Japan. 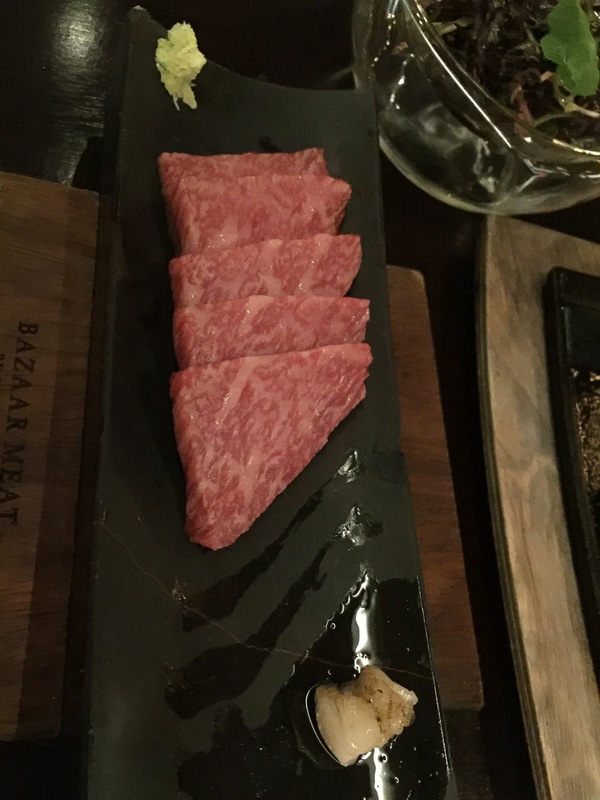 As the menu states, Bazaar Meat is one of the few restaurants in the country certified to buy and serve authentic Kobe beef from the Hyogo Prefecture. We learned later from our waiter that in fact, Bazaar Meat was one of only 8 restaurants in the United States authorized to serve this kind of meat. 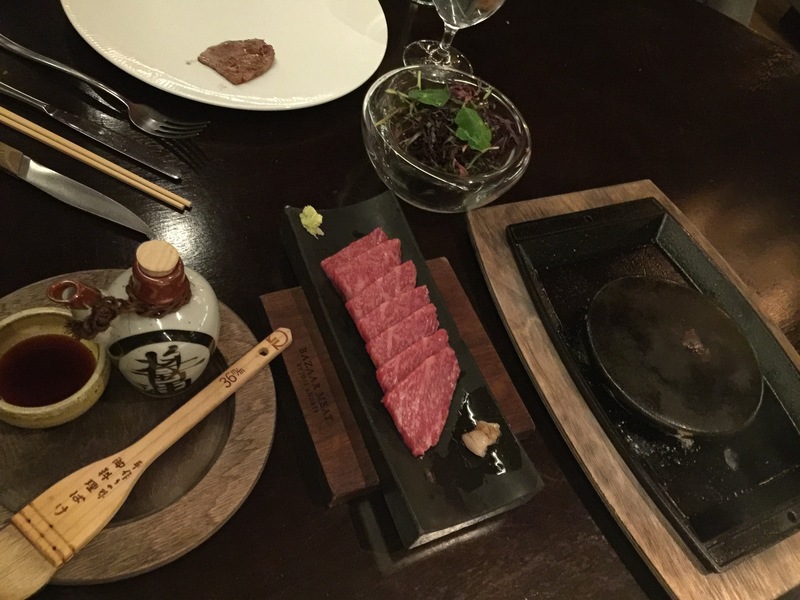 Served with an Ishiyaki grilling stone, mustard frill salad and fresh wasabi, we were required to order a minimum of 2 ounces of beef. To my husband, he said if we were going to order it, we should order an amount substantial enough that we could enjoy and savor it, so I gave it and said we could go ahead and order 4 oz. This beautifully marbled beef was brought to the table along with the grilling stone and all of the accompaniments by a waitress who then asked us if we had ever cooked beef in this manner before. When we had both said we hadn’t she asked us if it would be ok for her to demonstrate for us. 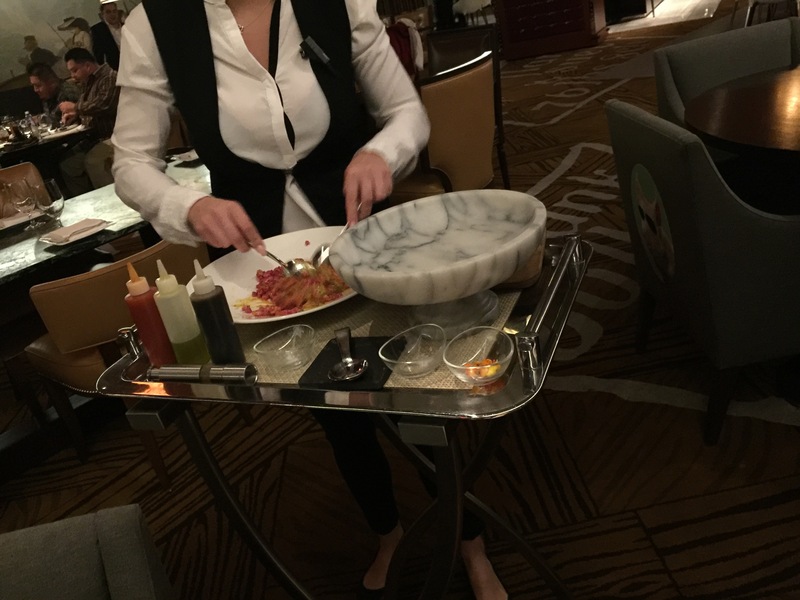 We told her to go ahead and she demonstrated that on our plate of Kobe beef we had a little bit of beef fat that we should put onto the hot stone first and coat the surface of the stone so that the Kobe we were about to grill wouldn’t stick to the stone. Now, mind you, while the stone was sitting inside a cast iron pan, there was nothing else sitting there except for this incredibly hot stone which would serve as our grilling surface. The minute the beef touched the grill it started sizzling immediately. The waitress demonstrated that the beef literally took 15-20 seconds maximum on each side before it was seared on the outside to a beautiful medium rare. Once the Kobe was grilled, then we were to take this little bottle of unpasteurized Japanese soy sauce, and use the brush provided to brush a little bit of the soy sauce over the beef to provide some added flavor. Honestly, the beef was so incredibly tender and flavorful on its own that it didn’t need the soy sauce. 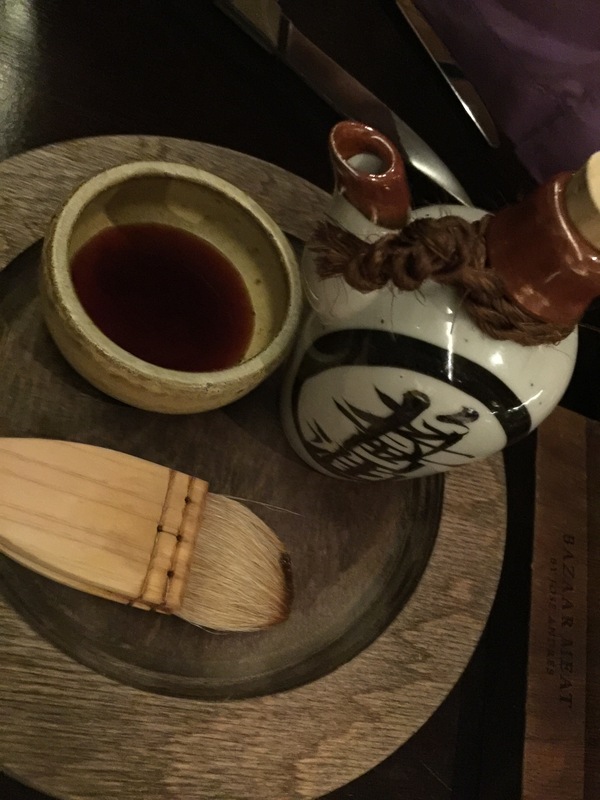 But that unpasteurized Japanese soy sauce was amazing, and a little bit of it went a long way. First off, the idea of cooking the meat ourselves was one of the most amazing and fun things ever. 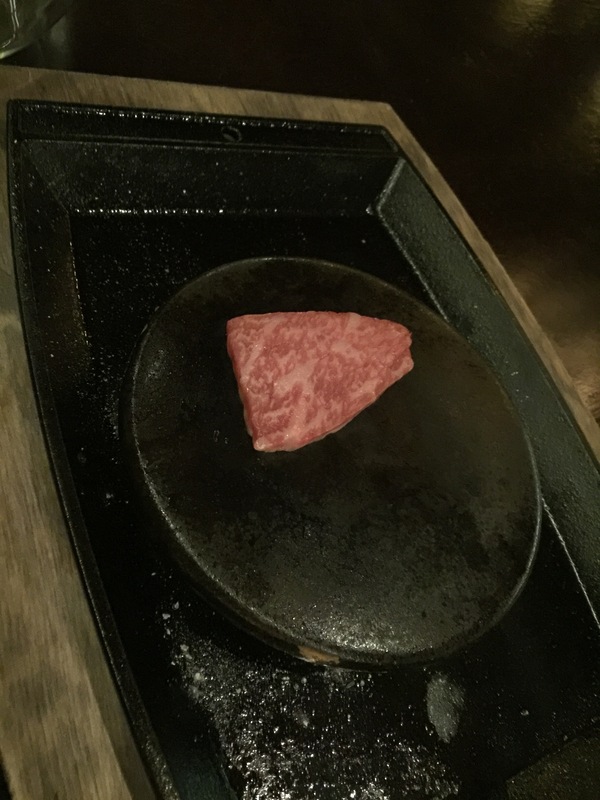 The amount of heat generated off that stone, and how quickly the Kobe beef cooked was so neat. The marbling of the beef was so perfect and the amount of flavor that marbling added was just a thing of beauty. This was, hands down, the best beef dish my husband or I had ever tasted in our lives. I’ve never tasted any beef that was so tender, so flavorful. I was so thankful my husband convinced me to order 4 ounces rather than 2 ounces of Kobe beef. Even as big of a beef lover as I am, I was shocked to discover that there’s a whole different level of flavor that beef can obtain from what I’d ever experienced before. This is what living the good life is all about. 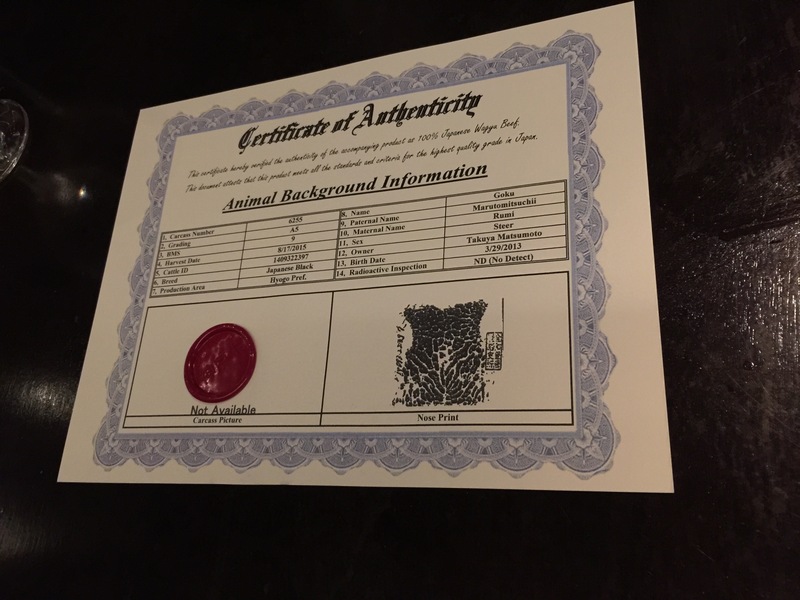 At the end of the meal, our waiter brought to us a Certificate of Authenticity from the farm where the beef is harvested in Hyogo Prefecture in Japan. The certificate told gave us all of the information we could possibly want to know about the beef we were being served; items such as when it was harvested, what grade of meat it was classified as, where it was produced, the name of the cow, the name of the parents of the cow, the owner of the cow, the date of birth of the cow, and even a nose print of the cow. A little morbid, I guess, but also quite fascinating. Can you believe our meal wasn’t over yet? We ordered a lot of food. Our next dish was actually a side dish of potatoes. Robuchon potatoes, to be exact. The description in the menu actually described the potatoes as butter, butter, more butter, some potatoes. And that was a pretty accurate description of the potatoes. Look at the butter sitting in the well of the potatoes. These were some of the creamiest potatoes I’ve ever had. And it seriously was butter first and potatoes second. Each spoonful was rich and buttery and decadent. Only on vacation would you ever eat like this. This was over-the-top potatoes at their finest. Our final dish was a beef rib steak of wagyu/black angus from Rosewood, TX. This was cooked Jose’s way at 46 degrees celsius and prepared Spanish-style with the bone-in and wood fired. This beautiful cut of beef was wonderfully prepared and exquisitely presented. Served with the bone that imparted all of the amazing flavor into the meat, the beef was grilled to a perfect medium rare. Again, the beef was of such high quality and was very tender with very little fat. The natural flavor from the wood-fired grill added a terrific smoky flavor to the beef. We were so stuffed by this time, it took all we had left to even try to finish this dish. We didn’t even want to think about dessert, but luckily we didn’t have to. I would imagine most guests are so stuffed by this point in time, that most don’t want to think of dessert either. So, instead, our waiter brought us, compliments of the restaurant, a box of little petit fours for dessert. An explanation of everything that was in the box was given to us and we were given the option to take the box to go, or enjoy some of the desserts at the restaurant. 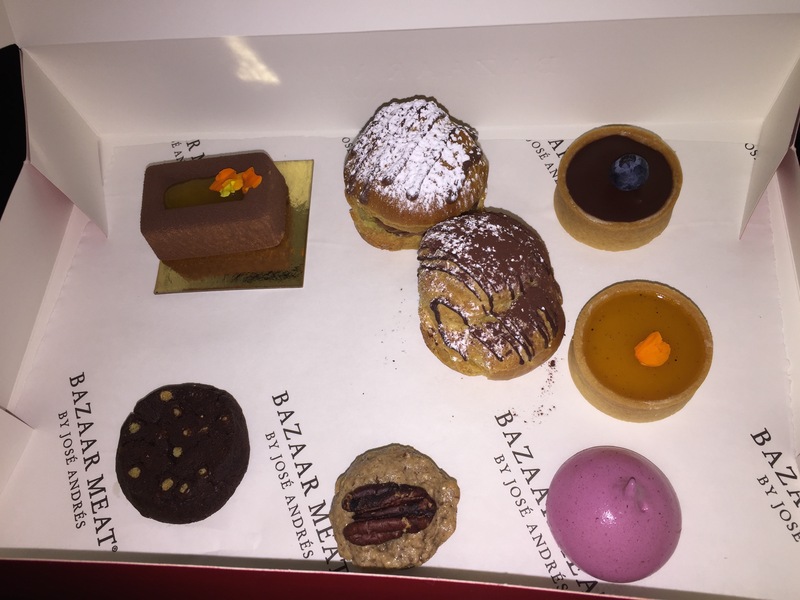 Our dessert box included apricot earl grey milk chocolate cake, hazelnut and dark chocolate cream puff, mango banana passion fruit tart, chocolate tart with blueberry, a cassis dessert and some cookies. 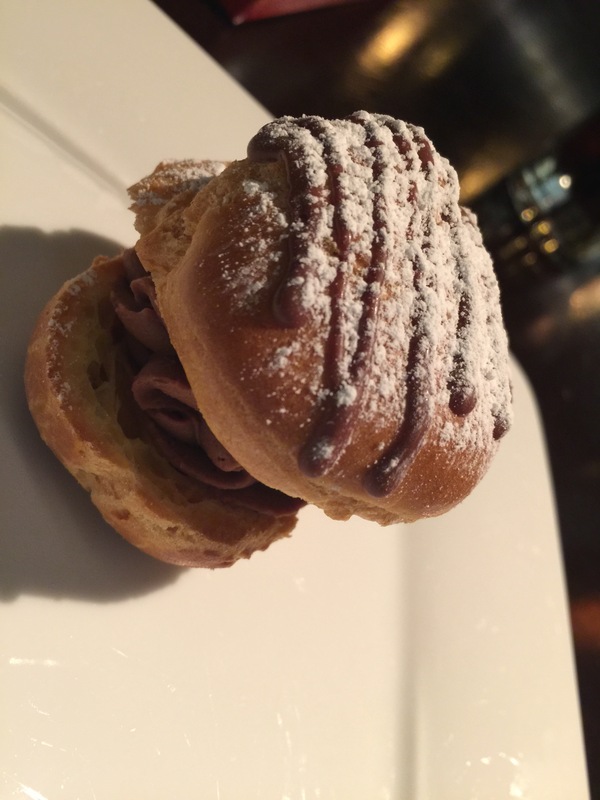 I had to try the hazelnut and dark chocolate cream puff. It was light and airy and the choux pastry was fantastic. The hazelnut and dark chocolate filling was delicious and lightly sweetened. My husband tried the apricot earl grey milk chocolate cake which was also quite light. The combination of apricot and earl grey added just a hint of sweetness to the milk chocolate and created a unique flavor profile to the cake. By this time though, we truly were stuffed and we just couldn’t eat any more. I felt like I was going to explode. 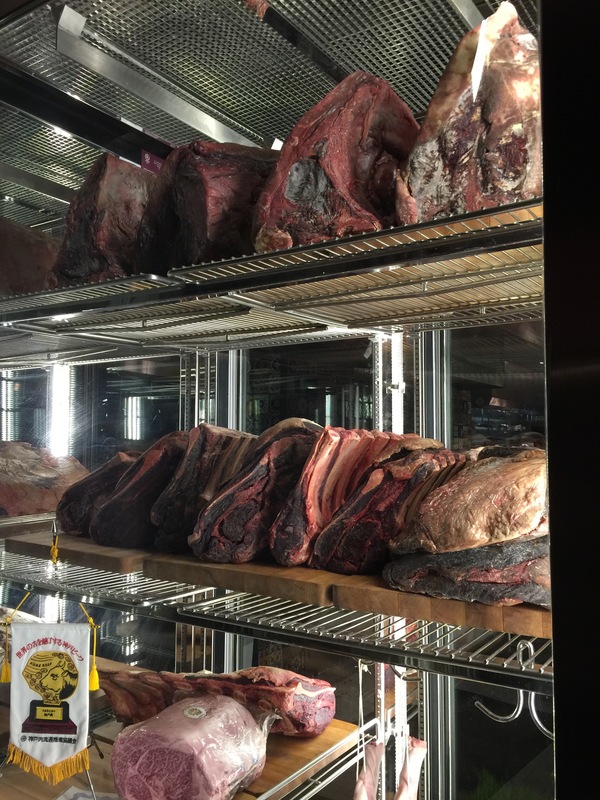 My husband and I were completely blown away by our experience at Bazaar Meat. We’d never had a more decadent, scrumptious and amazing meal as we had that night. The whole experience was over-the-top, but never strayed from the idea that in order to be memorable, the food still needed to be the star. And it was. I’ve never had beef dishes as amazing as we dined on at Bazaar Meat. The restaurant understands the concept of how to take a single item, highlight, transform it, and yet still make it the undisputed star of the dish. Each subsequent course we were served was more amazing than the previous course. This, without a doubt, was a meal that my husband and I will never forget. It was probably a once-in-a-lifetime experience, but it was worth every single penny we spent on this experience.